A good pair of wireless headphones is still relatively hard to come by. That’s not to say there aren’t many options about, but it’s fair to say that plenty of them suffer from problems that their wired counterparts seldom encounter. So, as you can probably imagine, testing the Sennheiser RS140 Wireless Headphones was an interesting experience. Well, as interesting as a pair of headphones can be anyway. The key to judging the quality of such a product is simply your level of expectancy. Let me explain, as far as I know there are very few, or indeed no wireless headphones at all that can deliver the sound quality of their wired rivals. Plus, they also suffer commonly from issues such as interference from other wireless devices of which I actually have many these days. So going in to the tests I had prepared myself that even though you pay a premium, they may not deliver the best audio experience in the world. Having said that, the feature set in the headphones is plentiful. For example, the headphones have an auto-tuning system, which decides between one of three channels at start up. It then uses the built-in memory to ‘remember’ the chosen channel for future use. It’s a useful feature to say the least, meaning you can find the one with the least interference and have no faffing around later on. OK, so many of you may be thinking, well shouldn’t this be a key part of any wireless headphones? Unfortunately not, as many, even premium offerings simply lack this functionality. Secondly, and more importantly perhaps is the ease of which you can balance the sound. A simple dial on the headset itself can be used to allocate a different level of volume to each side. However, this should not really be that necessary considering the headphones has an automatic ability to allocate the balance correctly. One downside to the manual changing though, is it is difficult to actually know when the balance is precisely in the middle, though it scarcely matters as long as the sound balance is comfortable for you at the time. The third great feature of the headphones is the charging method. You see, the headphones, as with the majority of wireless options, come with a charging dock/receiver unit. There are two metal bars protruding from the top of the unit, on which you can simply rest your headphones after use in a stylish and compact manner, whilst two metal contacts on the underside of the headband receive the power for charging. The first charge generally takes about 15-16 hours and thus far I have had no necessity to measure the endurance, due to the fact that an average 2-3 hour film will not drain the power, and then you simply leave them on the dock to charge. So how does the sound quality fare? Well, I have been using the headphones for several days now, watching a variety of TV shows and movies from my Mac Mini. Well, as I mentioned earlier, there are a fair few wireless devices lingering in and around the room in which they are situated. Therefore, it is inevitable they will suffer a touch of interference, by which I mean a distant static, humming sound, from time to time. However, the slightest amount of volume coming through the headphones eradicates any annoyance it may cause. Once you have that volume coming through the speakers, you find the sound quality to be actually, very impressive although don’t be expecting anything spectacular. During testing I decided to watch films of a variety of genre’s so first up was a particular favourite of mine, The Lord of the Rings: The Return of the King. Arguably the best, and most action packed of the trilogy, it provided ample opportunity for the speakers to show off its qualities such as great bass and due to the incredible soundtrack, its range of volumes too. Suffice it to say, they performed marvellously and in fact, the difference in quality was hardly noticeable between the headphones, and my Altec Lansing desktop PC speakers, though admittedly they were 20% of the price of the headphones. Secondly, I watched The Hangover. A comedy with little action but a memorable scene involving a tiger gave me a good indication of how the headphones can handle a good roar. It did. 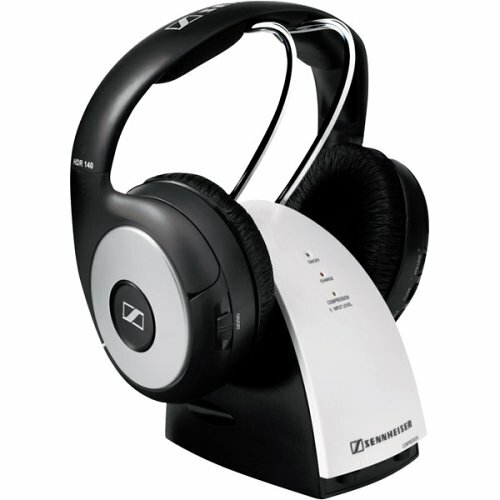 So, overall the wireless headphones provided a great sound quality, which was perhaps only slightly weaker than a decent set of desktop PC speakers, which is no humiliation for Sennheiser, and I believe they actually have maintained their reputation as a leading audio manufacturer with the RS140 Wireless Headphones. I will keep this section brief, mainly because there is not a lot to say as the design is so simplistic. However, it is attractive. Mostly black in colour with a contrast on the outside of each ear cup providing a stylish yet pretty basic look. The docking station is fairly sizeable which is a little annoying, but the headphones fit snugly on top to charge. Comfort wise, they are… well… very comfortable. The plastic material covering the ear cup is superior to the cheaper options, which feel quite frankly, nasty, and cause serial sweating from the ear lobes (sort of). The headband is extendable as you would expect and sit comfortably around the top of your head and you hardly notice it’s there. 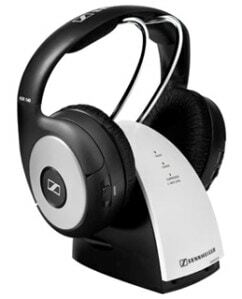 I have not come into contact with many wireless headphones in the past, but I can safely say that the Sennheiser RS140 Wireless Headphones set is far superior to any I have tried. The price, though seemingly steep, is actually quite a modest £109 on most websites such as Amazon and Play.com. A great investment and a quality product for those in need of such a solution.